AUCKLAND, New Zealand - Auckland City FC's 3-1 win over Tasman United has been overshadowed by a double head injury to David Browne and goalkeeper Corey Wilson. The Navy Blues led Tasman United after Javier Lopez Iglesias scored on the half hour mark before Browne doubled the advantage just after the halftime break. Wilson, who earlier tipped a Micah Lea'alafa effort over the crossbar, was beaten again by Lopez Igelsias midway through the second half. Tasman United snatched a way back into the match when they grabbed a quickfire own goal to hand the visitors a faint lifeline but the game disentegrated into a non-event. Wilson and Browne were both felled after a sickening head blow that left both players laid out on the Kiwitea Street pitch. Both players were taken to hospital in separate ambulances after a long wait that didn't see the match restart until nearly 4.30pm. Coach Ramon Tribulietx described the thoughts shared by most observers. "The major situation right now is the health of both David Browne and Corey Wilson who we want to make sure are both recovered as quickly as possible," he told www.aucklandcityfc.com. 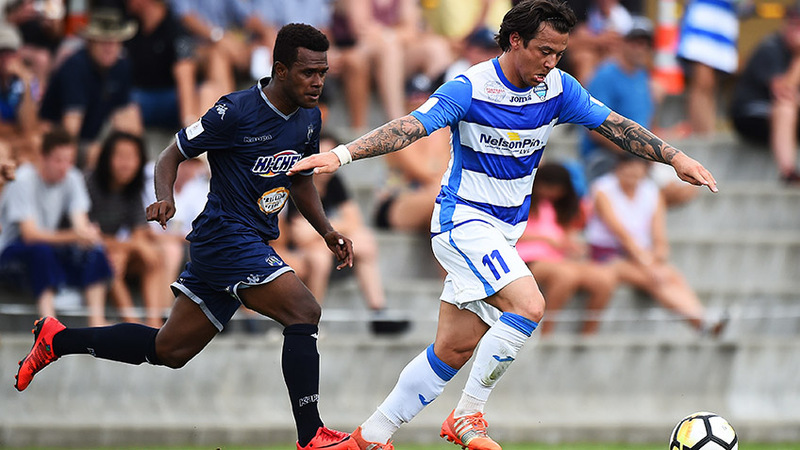 Auckland City FC's next match is away to Southern United. AC: 1. Enaut ZUBIKARAI (GK), 5. Angel BERLANGA (c), 6. Brian KALTACK, 7. Cam HOWIESON, 9. Javier Lopez IGLESIAS, 10. Micah LEA'ALAFA (12. Dylan MANICKUM 70'), 14. Jordan VALE, 15. Dan MORGAN, 17. Reid DRAKE, 19. David BROWNE (Takuya IWATA 76'), 20. Te Atawhai HUDSON-WIHONGI. SUBS NOT USED: 18. Ruben PARKER (GK), 13. Alfie ROGERS, 21. Maro BONSU-MARO.